A brand new tool company mailed one of their products to me to try out. It's not on the market yet; they are just testing it with focus groups. 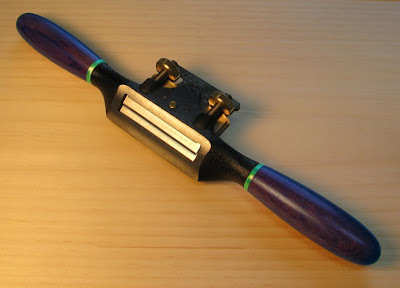 It's called a Track II Spokeshave and it operates the same as a regular spokeshave, but with the twin blades, it works even better. The front blade is designed to lift the fibers from the beard, I mean board, while the second blade trims them clean for a baby smooth finish. Not only that, but it comes with a spray can of foaming wood conditioner that you first apply to the surface. This helps lubricate the fibers so they're not chafed by the shearing action of the twin blades. It's a remarkable bit of ingenuity. I give it two thumbs up!